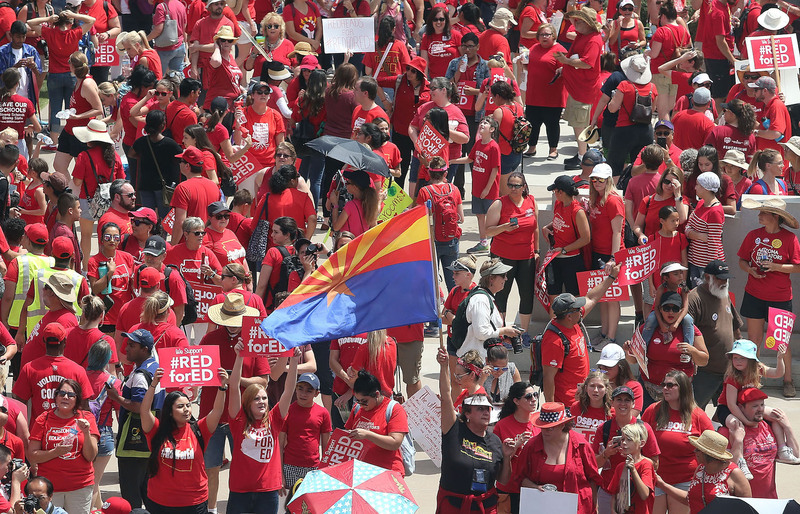 After an all-night encampment of striking educators, the Arizona state government passed a budget bill early this morning. To assess the strike and the settlement, Jacobin’s Eric Blanc spoke with Rebecca Garelli, Noah Karvelis, and Dylan Wegela. All three are teachers and leaders of Arizona Educators United, the rank-and-file organization responsible for initiating and leading the state’s Red for Ed movement. What were your highlights from the experience of the strike? Definitely the sense of solidarity. People here never really had that feeling before, that sense of being part of a union and fighting together for one purpose. But this struggle has given people an awareness that they’re not alone in this fight. The movement and the walkout really increased people’s political awareness and our level of grassroots organization. Fifty percent of the win here has been that we now have a strong, organized mass movement. And we’re not going away. People now have the courage to fight. It’s been pretty incredible to see all this energy, all this action and mobilization. But my personal favorite has been the emergence of local leaders at school sites. The local workplace infrastructure we’ve built has worked amazingly well. Individuals stepped up to become site liaisons; there are two thousand educators who’ve now become organizers. Another major highlight for me is that educators saw that they have power. They’ve realized that they’re exploited and that they have structural power. And in this walkout, they made their power felt. There’s been a very high level of right-wing attacks on the Red for Ed movement — red-baiting, threats of lawsuits, far-right provocateurs. What do you think is behind all of this? These attacks are an attempt to protect the power structure from those who are trying to take the power back. It’s all about the wealthy intimidating movements that challenge their financial interests. Arizona is ground zero for Koch brothers money, ground zero for charters, ground zero for vouchers, ground zero for privatization. We’re in the thick of it, and we’re up against a massive wall. I knew it existed, but it’s greater than I ever imagined. I really think our members saw the nature of the government here, just how wrong it is. It all comes down to lining their pockets through these investment projects. That’s where the right-wing attacks come in. Arizona Educators United has said that this budget incorporates some important concessions to your movement. What are these? The main positive is that eight weeks ago we weren’t going to get this much in funding from the state. In these eight weeks we’ve moved the needle on a government that didn’t want to give us anything. We’ve increased the added education revenue from $65 million to more than $400 million. We were going to get a 2 percent raise, and now they’re giving us what they’re touting as a 10 percent raise. Also, the initial proposal Governor Ducey made was just for a stipend — but we succeeded in getting this raise put into the base. There’s another important win: in the governor’s original budget proposal, he wanted to find funds for the raises by stealing money from other programs — for students with disabilities, from Medicaid, from the arts. Those cuts would have been very damaging to vulnerable populations, and they would have been very detrimental to our cause. Now, because of the pressure of the walkout, they removed those cuts. We did that. That was a win. The fact that this movement in the span of eight weeks forced a right-wing government to make concessions is a big deal. So is the budget enough? Of course not. Are we going to come back for more and get everything we demanded? Yes we are. Before Red for Ed, we weren’t going to see anything from the governor. Then he started talking about a 2 percent pay raise, $65 million dollars. We kept on mobilizing. Then the governor started talking about a 20 percent raise eventually — 10 percent immediately — to try to prevent us from walking out. But people need to remember that before the walkout, the governor’s plan was still up in the air, nobody was sure whether it’d happen or not because the legislature initially didn’t support it. Now we’re looking at over $400 million in total additional educational funding — that’s huge. What do you see as the budget’s main problems? We’re opposed to this budget, it does not give us what we want. It does not put $1.1 billion back in the funding. What it does give us is a tiny piece of the puzzle, $400 million dollars. Which means we’re responsible for going and getting that other $700 million. We’re going to pivot and go fight to get that money ourselves. We need to fight for the money for our kids and colleagues, because they’ve been left out — and that’s one of the main reasons why we don’t support this budget. It’s clear that the legislators don’t care about any of us or about the students. It’s blatantly obvious that funding K-12 education is not a priority for them. One problem with this budget is that Republicans want to punish Tucson homeowners by essentially raising their taxes to pay for a larger share of the federally mandated desegregation program. Also, a portion of the budget is tied to results-based funding, meaning that low-income districts that perform worse on standardized testing would get less of those funds. And there are big problems with the raise. Ducey’s claim that this is a 20 percent raise, with 10 percent immediately, is a lie. There’s going to be a pot of money for the teachers, and it’s going to go to the districts. The districts are then going to have to choose whether the teachers get the full 10 percent increase or whether the money should be stretched out to pay for raises for support staff and other employees. So what Ducey is calling a 10 percent raise will actually be significantly lower, since we’re likely going to want to give raises to our colleagues and classified staff. Last night we fought for amendments to the budget to include all employees in the raise, but the Republicans didn’t budge. And for the additional 10 percent raise, it’s all just a promise about the future. Ducey is only responsible for the next few months before the November elections — he didn’t guarantee any of the later funding. So the 20 percent raise is not a reality. If you opposed this budget bill, why didn’t you decide to continue the walkout? I can relate to the sentiment of teachers who wanted to stay out. There’s a real feeling among educators that we wanted more immediate action from this government, and I was empathetic to those who wanted to keep going even if the budget passed. But, honestly, I’m not sure if we continued to walk out whether we would have gotten that victory that some people hoped for. It’s been a messy week. Some districts have already been forced by their own superintendents to reopen. Others districts were facing increased intimidation to go back. So there’s been lots of pressure to return to work. And Ducey has been blasting the press all week saying that he gave us a 20 percent raise. Lots of parents may not have responded well if we continued the walkout after the governor signed what they’re being told is a big win for teachers. It was definitely a difficult decision: do you stay out and try to force a special session, or do you take these concessions, return to work, and go on to fight for more? The legislature made a partisan deal. We all knew they were going to leave town after they passed the budget. So we would have been left yelling at an empty building trying to force a special session — to call that, you need a two-thirds vote from the legislature or a decision from the governor himself. But we didn’t think that they’d respond. We were getting a lot of pressure from all sides to respond to this budget and to go back to our classrooms. And if we stayed out to try to force a special session, classified staff — who don’t get paid during a walkout — would continue not to receive any checks. The reality was that we didn’t think we could get anything more from these legislators. Our thought was that if they would have conceded more to us, it would have already happened by now. Though they haven’t done everything they’re able to do, they’ve done all they’re willing to do. So we thought it was time for a shift in tactics. Though most educators I’ve talked to agreed with the decision to go back to school once the budget was passed, some educators were disappointed or angry that you didn’t put this up for a democratic vote. Since you had voted to begin the strike, why didn’t you vote this time? Things moved very quickly on Tuesday. We were talking with some allies, and we got intel from inside the House and the Senate that it looked like the budget was going to pass so quickly that day that Ducey could have called a press conference and ended the strike in his own voice. And we didn’t want that to happen; he would have claimed victory, and he would have run a victory lap. So we felt that we had to get out in front of that. Unfortunately, we didn’t have the opportunity or means to poll everybody. We wanted to do it democratically, and we wanted to give members a vote. But we couldn’t get it done fast enough, since decisions had to be made quickly. And there’s no real cell service down here at the capitol right now to do anything right electronically. The last time we tried to do a task online, it failed. The clock was ticking, and we had to make a move. Before we had the press conference, we deployed our organizers into the capitol lawn yesterday to talk to people informally to get a temperature check. And the educators we spoke with generally felt that taking the government’s concessions and continuing the fight in a different way was the right move. So we pulled the trigger. We own up to the fact that we should have had a more democratic process. Hindsight is twenty-twenty. And moving forward we’re going to do a better job of making sure everything is democratic. What do you think the next step for the Red for Ed movement should be? One of the things that’s really unique to us in Arizona, compared to the other states, is that we’ve got a ballot initiative to fund schools by taxing the wealthy. If we didn’t have the ballot initiative in our back pocket, it’d be a different discussion. We’ve learned that these legislators will only do so much — and that then you have to take the power into your own hands. That’s what this initiative does. The ballot itself is a progressive tax: it’s going to tax the top 1 percent of earners, and it’ll generate about $700 million dollars. Passing this initiative, combined with what we’ve already won, would allow us to basically restore the 1 billion lost since 2008. Of course, winning this initiative is going to be a huge fight, it’ll require deep organizing and big mobilizations. We’re up against some powerful forces. But popular opinion is now on our side. Overall, I think this progressive tax initiative is really exciting. A lot of other educators in other states who are in these types of fights should look into similar ballot campaigns. The reality that we’re seeing in state after state is that it’s very hard to force state governments to move funding levels to where educators think it needs to be. But you can take the power into your own hands, and you can finish it that way. For those across the country watching Arizona, what do you see as the big lesson of your struggle so far? To fight back effectively, it doesn’t matter what state you’re in. If the issue that you’re fighting for is just, and working people mobilize behind it, you can bring about real change wherever you are. If you have a solid team, a good organizational structure, and a clear strategy, you can win. The types of attacks we’ve seen in Arizona are common to the working class across the whole country. We’re being exploited, we’re being taken advantage of. We’re overworked, we’re underpaid, we’ve been surviving on too little for too long. But what we’ve done in Arizona is stand up and say enough is enough. There always comes a breaking point for the working class. If educators in Arizona could stand up and fight back, anybody can stand up and do the same. Noah Karvelis is a leader of Arizona Educators United and a K-8 music teacher at Tres Rios Service Academy in Tolleson. Dylan Wegela is a leader of Arizona Educators United and a social science teacher at Marc T. Atkinson Middle School in Phoenix.